Are you an Expat Business Hero? I recently was a guest on the podcast Expat Business Hero. 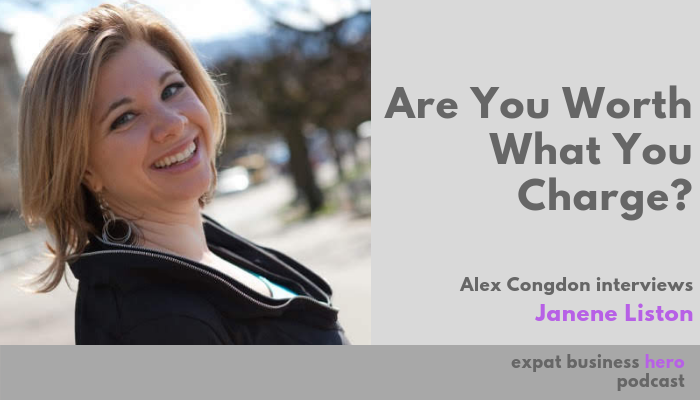 Alex Congdon and I talked about some of the challenges of ​​entrepreneurship and of course we talk about pricing. We talk about the link between pricing and worthiness. Especially in service based business this link can hold business owners back from what they want to achieve. ​We also talked about what to do when you find yourself brainstorming ways to lower the price. This is a common situation business owner find themselves in and it's often not because they don't deliver the value. Starting a business is by no means a simple task. Doing it in a foreign country dials up the level of difficulty. That doesn't mean you don't do it. It does mean that there are more obstacles to over come. Pricing (as the biggest profit lever) was (and still is) one of the areas that most businesses haven't fully leveraged. For entrepreneurs, pricing is an area that often brings about a lot of emotion and discomfort. I often thought to myself, "Could I do that as an ​entrepreneur?" However I was afraid to step out and take the risks that starting my own business required. ​With time I realized that I'd never know if I didn't try. Which is why I finally decided it was time to find out. ​​We talked about many other topics during our short conversation. How important it is to follow your heart. Why sometimes your word means a bit less than you thought. Moving to Basel. Moving from the corporate world to the entrepreneurial world. ​How Alex and I met...by chance. ​Until next time enjoy pricing!